Fallout 4 hits this fall as the much anticipated and welcomed next-gen game in the Fallout series. 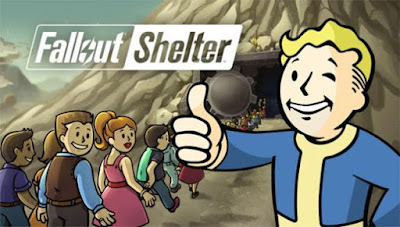 For those who just cannot wait and are on iOS right now, you can download Fallout Shelter, a free game that gives you control over your own vault (the Android version will be out in a few more months). You decide who comes into your vault, what job they do and how they progress; basically you are the computer controlling it all. The gameplay is simple enough in that it teaches you quickly how to build/upgrade new rooms and get new dwellers. The vault rooms run on power and the dwellers run on food and water, making it necessary to have a balance of rooms to run everything. To build rooms though you need caps. You collect caps in a number of ways--by completing goals the game gives you, leveling up your dwellers, sending a dweller into the wasteland (where they can also find weapons and outfits) and by rushing a room. To rush a room means you speed up your dwellers to finish their task and get your resources faster, but it comes with a risk of an incident happening. When an incident happens it’s pretty funny. For instance, a fire breaks out in the room or radroaches invade it. You'll have some dwellers running around and freaking out while others will put the fires out or fight the radroaches. This is where having weapons is a big help in killing them, as they emit radiation that can kill your dwellers fast. 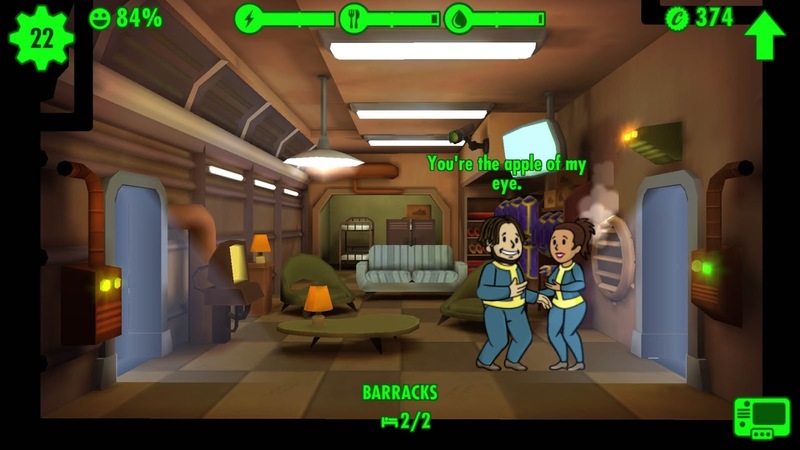 Don’t worry if any of your dwellers do get killed, as you can revive them for some caps. Weapons also come in handy when bandits attack your vault and you have to stop them from stealing supplies. This game has all the elements of a mobile game that gets you addicted without the need to wait too long for supplies or have to buy stuff to advance your vault. Fallout Shelter is definitely worth checking out, especially because you can play it anywhere and not need to be online to do so. The fact that you get resources so fast it keeps you constantly looking at it to make sure you don't miss anything. And it's completely free with no in-app purchases needed to advance your game. That's one of the more beautiful aspects of the game: you're not required to buy anything to grow your vault, get new dwellers or get better gear to equip your vault dwellers with what they need to survive. The whole game is at your fingertips right from the get-go; it’s up to you to keep your vault dwellers alive and keep it safe from raiders, radroaches and fires that are trying to bring your vault down. Fallout Shelter lets you see how far you can take your shelter and survive in the unforgiving radioactive wasteland you find yourself in. It's a welcomed game in the series and a nice stopgap until Fallout 4 hits stores this fall. 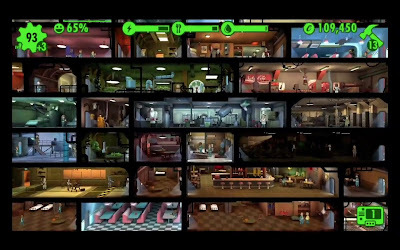 Putting Fallout on a mobile device seemed like an impossible feat, but Bethesda pulled it off with Fallout Shelter. The past few days I've been hooked on this game. From collecting all the resources I can to getting as many new dwellers in my vault to sending my dwellers into the wasteland for loot, the game keeps you coming back and looking towards your next goal. 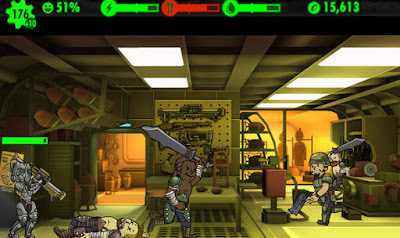 To describe Fallout Shelter on iOS in two words would be addictive and fun.